In this blog I will provide my thoughts on the first topic. The number one impediment to understanding customers is that marketing research has tools that work “top down“. Marketers typically use regression approaches to measure the independent impact of TV advertising, digital, mobile, etc. Media metrics measure reach within one or two channels. We measure brand performance, customers and sales but this is all top down thinking. Rarely does marketing research work bottom up which is needed for consumer-centric research that addresses “How many times, in what ways and at what moments of relevance did we reach a PARTICULAR consumer across their whole journey and how did this affect preferences and behaviors when we add it all up? Isn’t this the essence of integrated marketing and omnichannel retailing? Ironically, media is becoming increasingly “bottom up” as that is exactly what programmatic marketing is about where 100 million or more users are marketed to individually based on profiling data that is contained in a DMP (Data Management Platform). And Researchers better get on board. What does it take to influence a given consumer to produce a successful outcome? What is that media symphony across screens and moments for a given consumer that would be decisive? What is the exact right way of delivering a message, and what message to a given consumer for maximum relevance and impact given where they are in the journey? What is the frequency distribution of message delivery across all screens and touchpoints by consumer, that indicate how many consumers are getting wasteful levels of frequency? 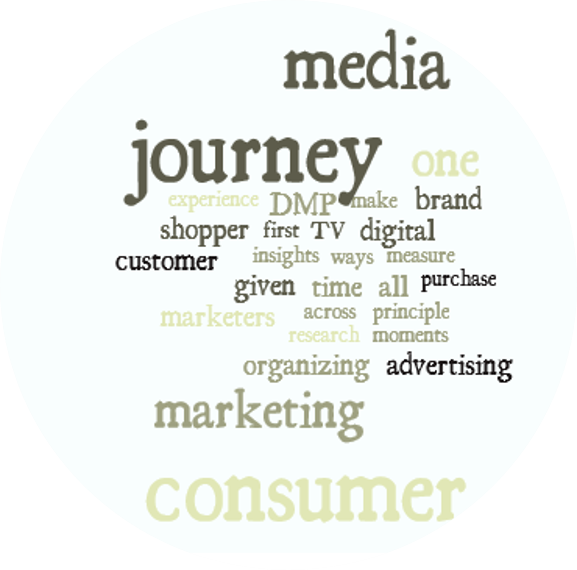 Let me hypothesize that media touchpoints have different degrees of impact depending on where someone is in their journey. I suggest that what TV advertising does best is to create desire and brand predisposition. If so, the value of TV advertising is to influence the start of journeys but not so much the moment of truth. Alternatively, let’s assume that your website content and search don’t do much to generate demand but what digital does best is to influence the information gathering stage of the purchase journey that has already begun. Hence, programmatic targeting of digital messages, offers and content would be focused not only on a segment of consumers but on an audience that is co-defined by where they are in a journey based on their digital breadcrumbs. Finally, numerous shopper insights studies reveal that roughly 50% of purchase decisions down to the brand level are determined right at the point of purchase. Those who are ready to transact will be most affected by shopper marketing, and I include location sensitive mobile marketing and properly timed emails as part of shopper marketing. In this scenario, the “one answer” marketing mix modeling approach to understanding how effective one media channel is vs. another, follows the wrong mental model. Effectiveness is individual and conditional on journey context. Performance shortfalls can now be unpacked and media/customer contact strategies revised based on where the marketer is underperforming. So what will it take for marketers to move to a consumer-centered approach? Marketing research needs to understand and connect to the power of the DMP (Data Management Platform) as an intelligence engine and load as much intelligence into it as possible, user by user, at scale. Therefore any brand tracking research, segmentation, shopper journey work cannot stop at insights; you need to model it onto the DMP at scale (e.g. 100 million+ users). To do this current lookalike modeling approaches are a start but INSUFFICIENT (I have developed the math extensions needed to do this properly). The power of this is to measure the customer journey and what media communications a given user has been exposed to by simply running a query against a DMP that has been properly enriched. In other words, the DMP becomes not only your ad targeting engine, it also serves as a continuous insights engine…like a tracker, but at scale, and instantly actionable because it is all coming from the same data pipe. So, for certain key metrics, the slides/dashboards are not being fed by research; they are being fed by the DMP which has been enriched with research. It is an important difference. Make the consumer your new organizing principle. Make your research work bottom up and bring it to scale. It will make your marketing better…more efficient and effective, and make marketing research more relevant to the new world of data driven marketing. Some have started this transformation in research data strategy. Don’t wait too long to start your own journey. This is a fascinating perspective in the intertwining of research and marketing and taking a bottom up approach. Having captured experiences in real-time for 10 years we know that a meal deal poster featuring a soft drink can be highly influential for someone walking to buy lunch but irrelevant later in the day. Whilst a poster advertising utilities/services on the commute home will generate a more positive response than earlier in the day. Taking all these insights and delivering marketing at scale could totally transform a brand’s performance, not simply show small incremental improvements.